“Look for the Silver Lining” on guitar makes great use of inside chords. Jerome Kern wrote “Look for the Silver Lining” for an all-but-forgotten musical called Sally, but most people who know this call to optimism are familiar with the versions sung by Judy Garland or jazz trumpet great Chet Baker. 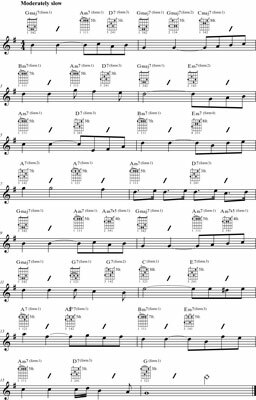 Play this song moderately slowly, and try to let the chords that last only one beat (such as the Am7 and D7 chords in bar 1) sound as legato as the chords that receive two beats. The trick to this piece is making quick and efficient motions between chord changes without affecting the ring-out of the chord strums themselves. You need to change chords quickly, but you must also allow the chords to sound for their full duration.